The Sapporo Snow Festival, one of Japan's largest winter events, attracts a growing number of visitors from Japan and abroad every year. The Sapporo Snow Festival is held during one week every February in Hokkaido. The event, which began 60 years ago, has evolved from high school students building snow statues in Sapporo's Odori Park to a world-renowned event with hundreds of ice and snow sculptures attracting more than 2 million visitors each year. Japan's fifth largest city first secured its place on the international tourist map by hosting the 1972 Winter Olympics, and its snow festival has helped keep Sapporo in the spotlight. Japan's fifth largest city first secured its place on the international tourist map by hosting the 1972 Winter Olympics, and its snow festival has helped keep Sapporo in the spotlight. In 2009, the Snow Festival was held from Feb. 5-11. A snow sculpture starts with a wooden frame built to a blueprint and then filled with tightly packed snow, which is transported in from 15 locations around the city. Once the snow is hardened, the frame panels are removed and the sculptors begin carving with hatchets and shovels. Since the warmer daytime temperatures make the sculptures more fragile, most sculptors work at night. The subject of the statues varies from year to year - a great advantage for repeat visitors - and often features an historical event, a famous building or well-known person. 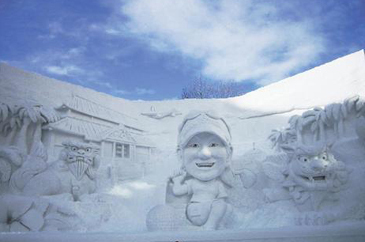 New York Yankees star Hideki Matsui was recently honored with this frozen tribute. The festival's spectacular snow and ice sculptures are located in three principal locations around the city. The largest site is the one-mile-long Odori Park. There, the observation deck of Sapporo's TV Tower provides an exceptional overview of the statues. In addition to several Western hotels operating in Sapporo, there are several major Japanese chains including the New Otani and Keiko Plaza with properties in this area. A second venue, the Susukino site, is located a subway stop south of Odori Park. Susukino is Sapporo's largest entertainment district and worth a visit any time of the year. The area wakes up as the sun goes down with restaurants, izakaya-style pubs, karaoke clubs, amusement arcades and ramen-noodle stands along Ramen Yokocho (Ramen Alley). A bowl of steaming hot ramen goes down particularly well after some time at night spent among the artistically lit (until midnight) ice sculptures. For those wanting to stay in this area, the Sapporo Garland Hotel is a popular choice. A third venue is the Tsudome site, located near Sakaemachi Station on the Toho Subway Line. Among the ice and snow sculptures in this more remote location is a snow maze that can be navigated by foot. For those who want to dig deeper and gain historic knowledge of the festival, the Sapporo Snow Festival Museum is a must. Located on the Hitsujigaoka Observation Hill in Toyohira-ku, the museum displays an impressive array of historical memorabilia and photographs.